March 5, 2009 | SALT LAKE CITY -- Tuesday night is usually an odd night to get excited for going out. This Tuesday was worth the excitement. Pop Evil returned to town as the headliners for their first Salt Lake show since opening for Tesla last year. The show was initially scheduled for the Avalon, but was moved the day of the show, due to fire code issues, to the Murray Theater. A crowd was lined up in front of the door by 6:30 for the show, even though the band was not scheduled on until 9:30. Everything was in place for Pop Evil to own the night . . . and they grabbed the evening by the throat. The band wasted no time in getting the audience going, kicking off with Breathe, the second song from their debut album Lipstick on the Mirror. 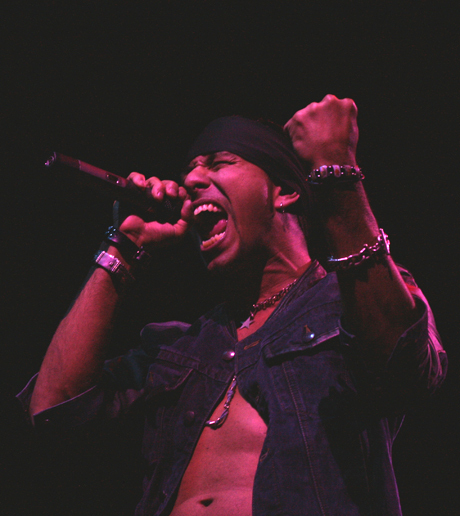 Energy flowed from the musicians as lead singer Leigh Kakaty took the stage, and Leigh again began laying it all out on the line, singing emphatically through not just his voice, but also with his hands and body movements. The audience barely had an opportunity to respond when guitarists Tony Greve and Dave Grahs ground into the opening riff to the fist-pumping anthem Three Seconds to Freedom. Songs in the set also included Ready or Not, Somebody Like You, Stepping Stone, Shinedown and the yet-to-be released track Rollin Stone, which has been met with huge underground success. Taking a no-nonsense approach and playing straight through with no encores, Leigh donned an acoustic guitar himself, strumming out the lighter side of the band's recent hit 100 in a 55 while everyone in the audience sang along. True to form, they finished up by igniting the audience with a stellar rendition of their biggest hit thus far, Hero. A Pop Evil concert is so much more than just listening to live music -- it's hearing and seeing the pure expression of great music flow from each of them. This show had all of the fireworks one could look for in a live performance without a pyrotechnics license ­ tons of audience interaction, heavy songs, power ballads, and even water spray explosions that would make HHH proud. Regardless of their national radio exposure, these guys are young and hungry. You can tell they love what they do, and you know that they love being in front of the live audience. Their show is solid, and it's a good bet that it won't be long until they are playing a bigger venue the next time they come to town.